Several of his videos have also been removed from Facebook and YouTube, and his personal page recently received a 30-day suspension from Facebook. However, some Spotify subscribers don’t feel the move went far enough, and are threatening to cancel their subscriptions if Spotify doesn’t completely remove Jones’ podcasts from the streaming service. People have taken to Twitter to voice their dissatisfaction, and a thread was created on Spotify’s community page requesting that Jones’ podcasts be taken down. Plenty of Spotify subscribers still aren’t happy with the company’s decision to include Alex Jones’ podcasts on the streaming service – and they’re threatening to cancel their subscriptions if his content isn’t completely removed. Spotify just confirmed that certain episodes from The Alex Jones Show were removed, citing its policy on “hate content,” but the majority of the episodes are still available, and Spotify did not clarify which episodes were removed or what specifically violated its policy. Now, Spotify users are voicing their dissatisfaction on Twitter and Spotify’s community board – one request for the removal of Jones’ content has nearly 2,000 votes as of press time. Hey @Spotify – I am a customer and heard that you are allowing Alex Jones air a podcast through you. If this isn’t pulled within a week, I will cancel your service. Jones is known for his far-fetched conspiracy theories, including perhaps his most controversial take – claiming that the 2012 Sandy Hook shooting was a hoax, and the victims were “child actors.” This claim has led to continued harassment of the victims’ families, and some of them have sued Jones for defamation. 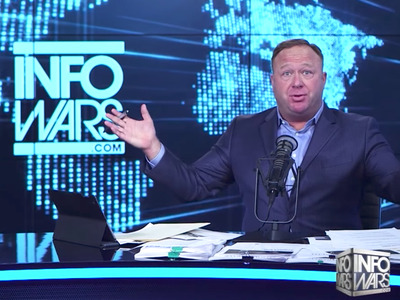 Although Facebook, YouTube, and Spotify have slightly reduced Jones’ platform, his show InfoWars has an app on both Apple and Google’s app stores – which effectively allows him to continue to broadcast regardless if he is suspended from the mainstream platforms.